Diablo A Go Go is one of the well known A Go Go in Soi Seadragon , the hottest lane in the hottest street of the hottest town of Phuket. Competition between Go Go bars is fierce (but friendly) to convince you to step in and “Have a look, Sir!” Diablo, at the end of the lane uses extensively this strategy to grab you before you can reach the very popular Suzy Wong’s located just next and I suppose it does work once in a while. 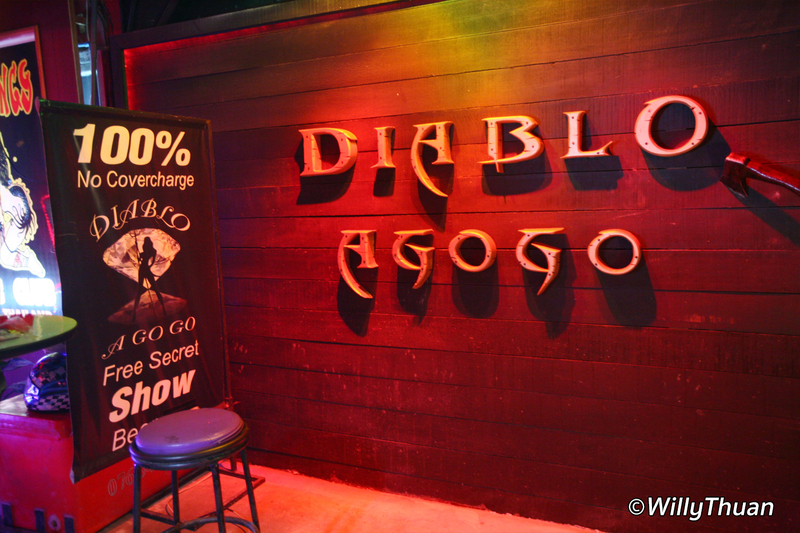 The exterior of Diablo has been refreshed when the entire Soi Seadragon was renovated and it looks quite fun and naughty. However inside hasn’t changed much: centered stage with poles, stools around the stage, sofas around the room, etc… (I hear someone mumbling “Are they all the same?” no they are not). But it is still good fun, it is a busy place but it lacks of action or originality, which is what the new generation of Go Go is trying to bring to the Phuket night scene… people come for fun, not only for girls anymore, and I’m always surprised to see so many couples sitting around. Prices are fixed as in most Go Go bars in this street, about 120 to 140 baht for a beer.